When I visited the University of the South Pacific in Suva the other day I saw a pond of waterlilies so made a drawing with pens and pencils. For other recent sketches go to the babasiga blog. Then today we were in Macdonalds to eat icecream so I drew the view from our table. We are still in Suva, Fiji but the connection to Geelong is only a click away on the internet and I still read the Geelong Advertiser. Here's a story from a week or so ago tht caught my attention. 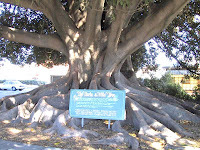 Our Geelong home is in the vicinity of Eastern Park and it's a special place for us. Go, Joan, go! Meanwhile I still am making a few drawings around Suva and will post them after they are scanned. A tummy wog has set me back a couple of days. That suspicious chicken in a dank cafe in the grotty arcade. I should have known better. Hmmm. EASTERN Park is undeniably one of Geelong's greatest treasures. 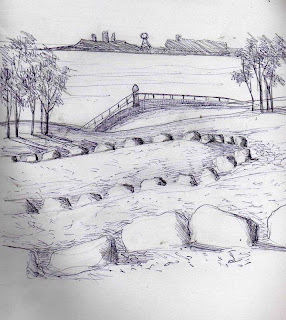 Many visitors to the park would be surprised to learn there are historic lime kilns and a small beach at Eastern Park, hidden away behind the gun club at Limeburners Point. 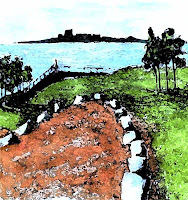 While the rest of Eastern Park is well maintained by the City of Greater Geelong, the lime kilns and beach are sadly neglected. 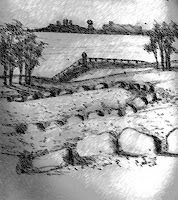 All manner of rubbish is washed up on the shore but the greatest amount of pollution comes from the gun club itself, in the form of clay targets, plastic wadding and lead shot. This club has recently celebrated its centenary _ 100 years of shooting clay targets into the bay. The clay targets do not decompose. They remain on the cliffs, foreshore and intertidal flats, and are slowly washed by wave action along the beach towards Point Henry. The rockpools we explored as children and the indigenous vegetation on the cliffs have been buried under an avalanche of clay targets. It is not surprising the gun club site is listed on the EPA priority sites register. It is surprising the club is not fined for the pollution or made to clean up the area. Limeburners Point in Eastern Park can no longer be considered a suitable location for a gun club. 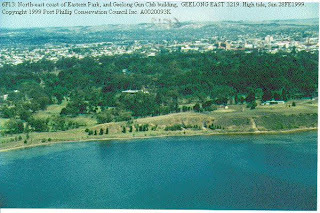 Although there is a path to the beach, the fences around the gun club site effectively prevent access to this part of Eastern Park and the extent of the pollution of this area is concealed from the general public. Seven years ago, the State Government announced the club must move so the site could be rehabilitated but the City of Greater Geelong renewed its lease for another seven years. Although the State Government did not promise to provide a new site, several alternative venues have been suggested over the past seven years, including a purpose-built facility at Werribee. The gun club has rejected every one. 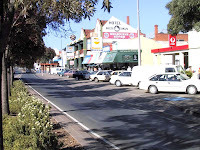 Eventually, the State Government removed the city of Geelong as committee of management and it seemed responsible action would be taken to remove the club and clean up the area, with the State Government issuing a notice to quit the site. The club has chosen to ignore the notice to quit and continues to shoot in Eastern Park. It has thumbed its nose at the State Government and the people of Geelong. The club continues to deny access to the foreshore, effectively preventing the general public from seeing the pollution it causes. 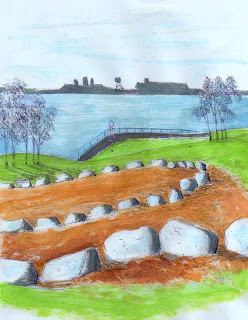 The Government has taken a softly softly attitude to the task of removing the gun club but stronger action is needed to protect our bay from ongoing pollution. The Government should commence cleaning up the area now, and start by removing the equipment, ugly sheds and containers on Limeburners Point. Easy access should be restored to the whole area as soon as possible. It would seem only fair the gun club members themselves contribute to the cost of the clean up, either in cash or in kind. This area should be one of the highlights of our beloved Eastern Park. 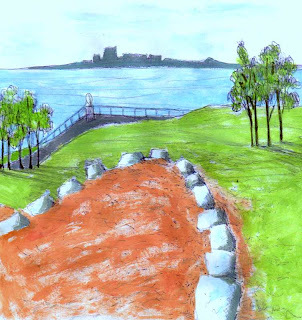 Families should be able to picnic on the point and enjoy the views, and explore the beach and the lime kilns. Joan Lindros is president of the Geelong Environment Council. I've been trying to watch some events of the Olympics but here in Fiji the bits and pieces of events come via New Zealand so there which is sometimes at sexes and sivins! Alas for Lee Troop though. After his years of training he came 60th, not in the top 10 that he had hoped for. Well, that's life, that's what happens to athletes and other people who focus on oe thing in life and it fails. To be in it is to be a winner anyway. but at least in Geelong and elsewhere in Australia to fail is not the worst thing in life. We jump up again, learn about life through failure. Our heroes are sometmes failures - Once a jolly swagman... and so on. SAMUEL Kamau Wansiru has won the men's marathon, the final event of the Beijing Games track and field program, with an amazing display of distance running. The Kenyan, aged just 21 years, won the toughest race on the Olympic program in a time of 2hr 06min 32sec, breaking the Olympic record set by Carlos Lopes of Portugal at the 1984 Games in Los Angeles by 2min 49sec. Wansiru, who was running just his third marathon after contesting his first nine months ago, gave Kenya, the spiritual home of distance running, its first Olympic victory in the event. Kenya had previously won silver medals in the marathon through Catherine Ndereba (Beijing and Athens), Erick Wainaina (Sydney) and Douglas Wakiihuri (Seoul), and bronze medals through Joyce Chepchumba (Sydney) and Wainaina (Atlanta). Kenya's joy was in direct contract to the despair of Australia's Lee Troop, who suggested after finishing a disappointing 60th that he would hang up his spikes. .....Race athletics greats Troop, who finished in a time of 2hr 27min 17sec, never looked likely to match his stated pre-race aim of securing a top-10 finish. "I can't put into words exactly how I'm feeling," Troop said after struggling across the line. "I felt fantastic at 19km ... but I started cramping in the guts - I don't know whether it was what I was drinking or not. "At 22km I felt fine, but at 23km my legs were smashed. "I just ran bad, simple as that." 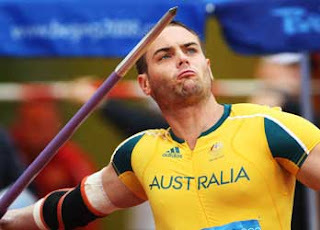 And Jarrod Bannister,who came 6th in the javelin, got an elbow injury that knocked him out of maybe getting a medal. Very bad timing for an injury. My son has a picture program that enabled me to alter the pictures I made in the last couple of days, but no psychedelic variations that I usually do! 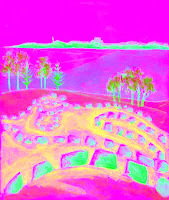 It's Friday today and my son scanned in some of my drawings I made of the gully below the flat in Namadi. This is a steep incline with a narrow creek that was transformed to a torrent after one night of tropical rain. Quite a backyard isn't it? There are more sketches on the Babasiga blog. Mostly by using pencils that are shared with the grandkids who like to lounge all over the floor over their papers. In the evenings my son gives the four children maths and English quizzes with little rewards. Grandma joins in too. Today is Tuesday and the rain has started, just light rain, but I don't want that cough back so I'm laying low in the flat above the gully as the kids in the household do drawings, watch the Olympics, play cards. It is school holidays here so our grand children are having a good time. It is Hibiscus Festival so sometime we'll go down to the ground to find some good local food and the kids can fly about on the ferris wheel, octopus, etc. I'm not doing much sketching and Peceli is coming and going to Methodist gigs - yesterday the 100th birthday of Davuilevu where he was a student in the 50s, and the conference meet today. He will try and find a way to get his photos back to me on my son's computer. The landscape here is gorgeous with flame trees, pink, orange and red bouganvillea, hibiscus trees, coconut palms, pawpaw trees, and when it is fine I'll do some sketches around the Namadi suburb. This is a bit upperclass here with plenty of guard dogs, locked gates, ultra-security, but not for all of us! Wow, the weather is different here. We left Geelong which was about 2 degrees at night, and 12 in the daytime. Here it is 22 at night, 28 in the day and the humidity is 80 per cent. Anyway, it's lovely to see our family - the grandkids are looking after me very well. The Air Pacific Spirit of Taveuni took just over four hours so it was a good trip. The supper was a bit strange though - a bun with some kind of curried chicken or fish, don't know which, dry biscuits and cheese, and a chocolate bar. Peceli asked for more! Economy class was crowded though and I got elbowed numerous times. We reached Nadi airport by 6.15 am. and a newly married couple met us (supposedly for breakfast together) but the bus was ready so we clambered onto the Sunbeam bus for the 4 to 5 hour trip to Suva. We were really stacked in, four to a seat for three, with bottoms hanging over the aisle. They just kept selling more bus tickets and shoving people onto the bus. It's school holidays, Hibiscus Festival, Methodist conference, bazaar, choir festival and rugby tournaments! At Sigatoka, not quite halfway, we stopped for 10 minutes. While I bought bananas in the market Peceli bought mugs of tea and two roti and curry parcels for our breakfast. I had a water bottle thank goodness. We reached Pacific Harbour to our daughter-in-law's lovely village by midday and it was a relief after the bus trip of grinding up a dozen mountains. A swimming pool was a welcome sight. More stories to come later. Instead of starting the long list of household tasks for the day, as we are going on a holiday soon, I really prefer to muck about on the computer, so here are some variations of the geoglyph pics I made. Not too psychedelic I hope. I am really averse to any kind of bird coming near me (since a childhood experience with turkeys I think) so wasn't happy when visiting my brother up at Swan Hill and being circled by a bird in the back yard. My brother has a sulphur-crested cockatoo that bailed me up at every opportunity. It has a cage but comes and goes at will and hangs around a locked door which it tries to open. If it gets inside it eats at the furniture, carpet, and wood. Well, I swore at it and told it to get lost and it squawked back at me 'No, no, no!' Then I heard it coughing and thought it was imitating my post-bronchial noises, but my brother insisted it was imitating a goggle-eyed little dog that comes and goes to the house. The cockatoo is quite crazy - barking, coughing, talking, rocking, dancing, chewing. It's about forty years old and was given to my brother 'to mind' several years ago. He treats it kindly and it follows him about in the back yard, but as for visitors like me, well, I'd like to turn it into a curry! I wouldn't waste a photo on it so I got a pic from google. I wanted to teach it to say rude words but Peceli prompted me to resist! Of course when you see these sulphur-crested cockatoos in the wild as we did near Stawell on our drive back from Adelaide, that is a different story. Flocks of them were beside the road and looked lovely. I do not agree with putting birds in cages anyway. I suppose that 'Clyde' the cat, gets along with it somehow. Peceli and I spent three days going to Swan Hill by train for my birthday and it was good to be back in my home town and look about, even visiting my parent's home in Boys Street - sold maybe ten years ago. 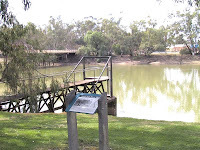 We had a picnic beside the Murray River, a dinner at the Federal Hotel - revamped as it once was rather scungy, and a restful time out of town breathing clean air. 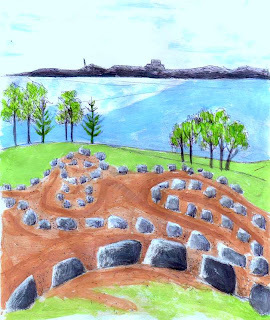 I added some colour to the sketches of the geoglyph at Eastern Park - as usual the colour is exaggerated a bit. We've been away from Geelong for a few days so will post something maybe tomorrow about out trip to Swan Hill. 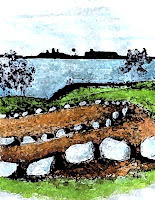 In the Geelong Eastern Park a sculptor, Rogers, used white rocks to form a Rhythm of Life geoglyph which can best be seen by plane or helicopter. He makes these huge earth-sculptures in various countries. 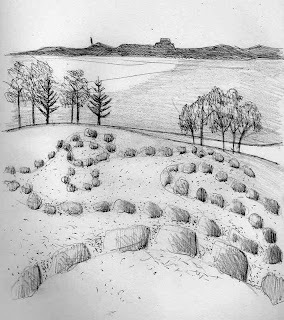 For the first time, Peceli and I walked amidst these mainly flattened rocks that overlook Corio Bay. A bit New Age encounter with stones seemingly facing the setting sun. This afternoon it was sunny and I needed some good sunshine and exercise to throw off this cough bug. 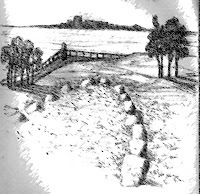 The sea was beautiful and we had a restful visit to this strange land formation. 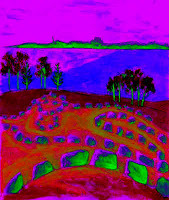 The coloured picture is of one of Roger's geoglyphs elsewhere, but similar in design. Usually when someone asks, 'How are you' you answer something like 'Fine! Great!' no matter how you are feeling. Sometimes though you ask someone 'How are you' and you get an organ recital back, especially some older people who live alone and they want to tell you everything about their aches and pains. Well, I think I have joined them in this. If someone today asks me 'How are you' I might say - 'Well I went to the third doctor (in the same clinic) and he sent me to the pathologist who complained that she couldn't get blood out of a stone but by the third try managed, and I said I used to give blood to Red Cross and she said, 'They must have been desperate' etc. etc.' It has been a learning curve for me to go to three doctors in seven weeks, all with different treatments for a persistent cough. One said 'It's winter, what do you expect!' I won't go into all the details of wearing a white gown backwards, hugging a cold metal machine for three pictures of a pretty (or pretty awful) set of lungs, etc. etc. but yesterday did remind me of the people who give organ recitals when greeted. 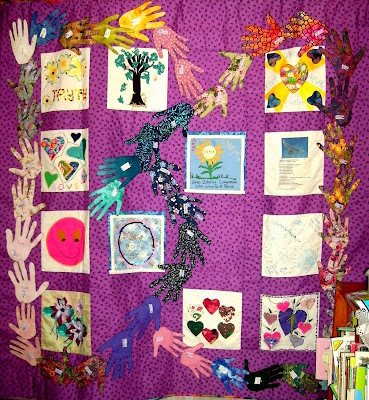 The women of the Interfaith group in Geelong recently made a quilt - each member making one square or hand etc. and one of the women put all the pieces together.